Rejuvenation ensures that the Circle of Life continues not just on Turtle Island (North America) but on all of Mother Earth. This piece represents this theme by depicting the moose - “moozo” to the Anishinabek – during the time of his peak fertility in the month of September. It is at that time that the cyclic procreative impulse of Creation manifests itself in Moose, who will often traverse great distances through the forests in search of the union that will bring a new generation the following spring. This interplay between male and female is further rendered here by the connection of the feminine moon to the masculine (bull) moose. 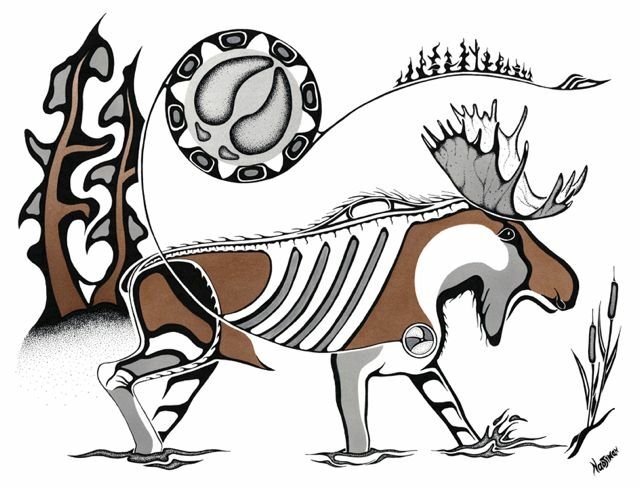 In the drawing, one can see the “energy” of this sacred time in the moon (represented by the large moose track) being sent down through Moose, connecting to his four-chambered heart.